Car Got Towed While Travelling in Perth. - . Car Got Towed While Travelling in Perth. 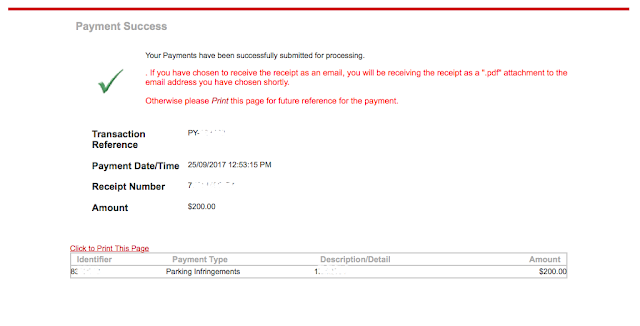 Early this month (SEPTEMBER 2017), i went to Perth and we rent a small car for 4 days. On our 4th day, our car got towed!! The situation was that, i parked it outside our lodge, at night, in a legal correct car park. What i did not read was, on the ticket machine was a small lil note on top saying the road has to be clear before 7.30am! meaning, i have to move my car out of that carpark before 7.30am. lucky me, already bought a local sim so called the number on the ticket machine. Got the wrong number, and was told to call another number. then, ....called the other number, and was given an address to go and pick up the car. was reminded to bring DRIVING LICENSE, CAR KEYS & MONEY (FINES). We walk then took a bus then walk again to the address given. Not far but also not near. At the counter, the process was quick. Pay then the guy help get our car out of the warehouse. Balik Malaysia and thought everything was ok, then suddenly last week (about 2 weeks after got back from Perth), i got a whatsapp from our car rental saying we have to pay infringement fines. infringement fines because i broke the law. and have to pay in 1 week after the invoice was issued. - bring any credit / debit cards, for emergencies like this. - activate international purchases / payment on your cards. - buy local sim card to call anyone in case of emergency.